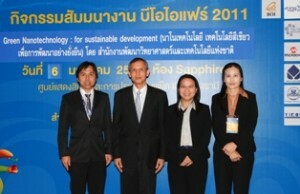 NANOTEC and the Thailand Board of Investment (BOI) organized a public seminar entitled “Green Nanotechnology: for sustainable development” on January 6 during BOI Fair 2011. The aim of the seminar is to promote public awareness to nanotechnology and its applications to green technology development for socio-economic development. • Mrs. Pornphen Opaskitpaisan, Nano-Safety Alliance Section, NANOTEC talked on “National Nanotechnology Strategic Development Plan”.